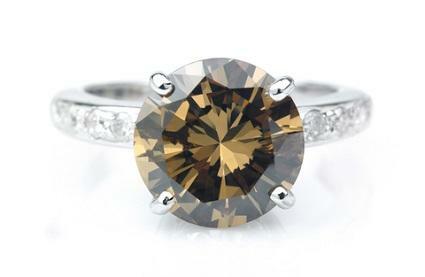 Champagne colored diamond engagement rings are good choices for women who want something a little different. Instead of the traditional transparent or colorless diamond, champagne diamonds have a brownish color to them. This color variation is caused by the structure of the stone getting compressed abnormally while it is still buried in the earth. C1 to C2 is light champagne, which corresponds to white diamond grade K to M.
C3 to C5 is medium champagne, which corresponds to white diamond grade N to Z.
C5 to C6 is dark champagne, which is a light or dark but close to pure. C7 is the most vivid of fancy and is an intense or perfect pure. Clarity is not as important in these stones as color, unless there are cracks that severely mar them. Fancy - These diamonds are determined to be pure in nature and have an intense champagne color throughout the entire stone. They may be priced much higher than traditional diamonds. Off-colored - The champagne color is a little too far on the yellow or brown side or a bit too light in color to be considered fancy and is therefore lower in price. Enhanced - The color is created artificially, giving the stone the look of a champagne diamond only after irradiation or a pressurized treatment. Sometimes these diamonds are entirely created in a lab environment. Note that since all of these types are rare, it is best to go to a specialty retailer as opposed to a jewelry store in the average shopping mall. The original source for champagne colored stones is often the Argyle Mines in Northwest Australia. They have the largest deposits of fancy colored diamonds in the world and produce natural colored diamonds in many beautiful shades. It's important to choose the right setting to go with a champagne diamond, since a bad one can make the stone's color improperly reflect light and appear washed out. Most jewelers would recommend a solitaire, since it is very difficult to find more than one champagne diamond that is exactly the same shade and color variations can detract from the stones and make them look imperfect. However, white diamond accents will work too. It's also important to carefully consider the color of the setting and choose one that best shows off the unique color of the stone. For example, a white gold setting can make a less rich champagne look flawed while a yellow gold may be too intense for a diamond that is of a rich brown. Darker shades are brown or cognac. The recommended cuts for champagne colored stones are simple ones, such as round or square. A decorative cut, such as a heart shape, can sometimes make the diamond appear uneven in tone. This is especially true for light or medium champagnes and for those that are off-colored. There is a very rare type of champagne diamond that has pink as a secondary hue. These diamonds are found almost exclusively at the Argyle Mines. Those lucky enough to get their hands on one should use the same considerations mentioned above when choosing a setting. They should also make sure that the bride to be keeps a very close eye on the ring, as a stone like this will be difficult, if not impossible to replace. Champagne colored diamond engagement rings are a lovely and unique option for many discerning brides-to-be. With elegant hues and a distinguished rarity, these colored diamonds are a popular trend for many modern engagement rings.